FIRST- I Hope ALL of you have a GREAT NEW YEARS! BE SAFE! 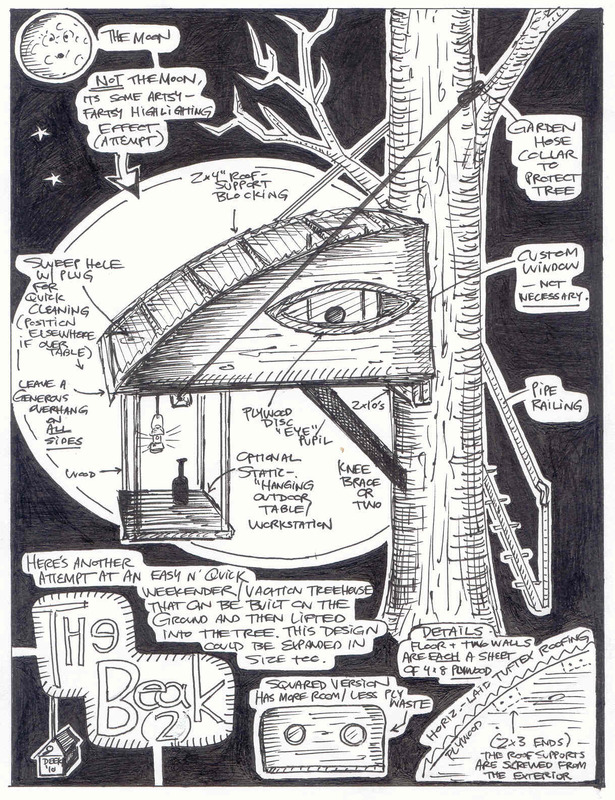 And…Here’s another sketch I did the other night of a VERY SIMPLE treehouse/tree-cabin idea- only 4′ by 8′- that could sleep one or two people for vacation-weekends/hunting/writing/snoozing/meditating/sketching (MY intent- a micro-office in a tree (again, a “Troffice”). The sketch shown gives the base-smallest size at which it could be affordably and quickly built- utilizing only 3-4 sheets of stock-size 3/4″ plywood. Naturally other wood is involved, but most of which is small sized lumber that could easily be found/salvaged over time, or bought inexpensively. Its a simple enough project in that it could be built, and then hoisted into a tree in a single day, and could serve as a means to help those not-so-carpentry oriented, to try their hand at several skills, approaches, and the usage of many tools. 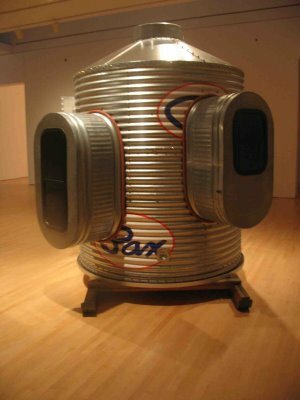 Its kinda funky/weird too- as opposed to building a boxier shed-like house- not that I have any prob with those (I have built many…). BUT THIS IS RIDICULOUS- ITS TOO DAMN SMALL (you might be thinking)! Well, width and height-wise, a structure like this could certainly be mathematically expanded upon to serve one’s needs. Other changes, such as a support post, to carry the weight of a larger version of this, could very simply be incorporated too. First, for all your newcomers to the site (welcome! )- here’s one of our latest editions of Tiny Yellow House TV (where we’re always in need of sponsors!- kidcedar@gmail.com). AND Since MANY have emailed and asked about my book (shown in the WBZ/CBS TV Broadcast, you can order it (while I still have copies) by clicking on the lefthand book icon). Thanks! RE: Relaxshacks.com and Tiny MA Homes on CBS NEWS- AND our Tiny House/Shelter Building workshop for 2011…. 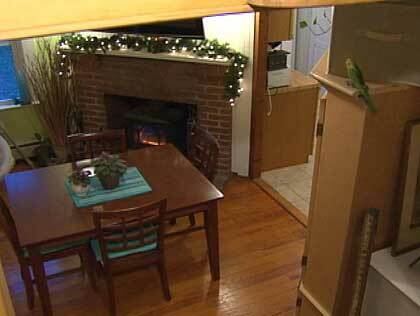 Tonight (or last night, depending on when you read this) WBZ, the CBS affiliate out of Boston, MA ran a story on tiny/small houses, as a means and lifestyle towards living on less in tough economic times. It was based on a shoot, and interviews, at both my house (they call it “tiny”- but its not- more so “small/modest”) and at Dustin and Dawn Diedricksen’s (yes, my brother- same state). Dustin’s house is where we’ll be hosting (outdoors AND in) our Relaxshacks.com Tiny House/Shelter Building Workshop 2011 here in Massachusetts (Scituate)- date tba. It’ll be a small group overall (15 or so people tops), and VERY eclectic with TONS involved/planned….email me at kidcedar@gmail.com if interested….and we’ll keep you updated. Wow….a damn pleasant surprise….especially since the UK site of author Alex Johnson features some incredible designs, sheds, builders, and overall concepts…..but my lil’ shed/single sleeper/greenhouse/sauna/ice-fishin’ shack combo “The Hickshaw” won The “BEST DESIGN” Shedworking award of the year. Crazy….esp as its made out of well, “trash”- almost all throwaway-materials. For those who have no ideas what I’m talking about sturcture-wise, its this goofy lil’ thing. I had a blast building it and never even intended to get so into online videos and vlogging, until we shot a joke-episode on this tiny cabin/shelter, and well, things kinda exploded…. 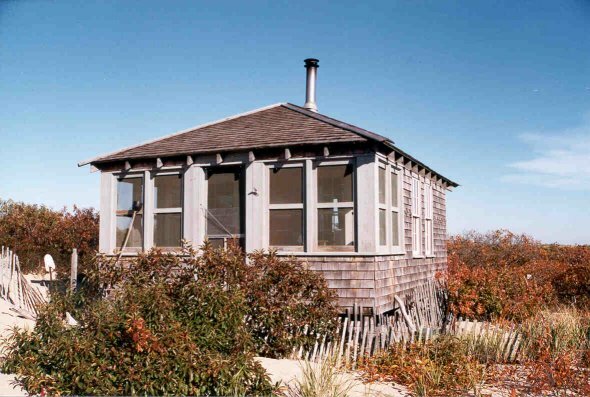 Today's EYE CANDY: Another beach shack near Provincetown, MA (near the famous Truro Beach Shack Compound?). Beginning tonight, running in their 11 pm news segment, WBZ Channel 4 TV News out of Boston (covering a good chunk of all of New England too) will be running a piece on my home, my brother Dustin’s home (and his Wife Dawn Diedricksen), and the whole small housing movement and its ties to environmentalism and thrift. I’m sure it’ll be a short segment, as it is the news, so don’t blink. I yacked with host Ken Tucci about my work with Dustin on helping to rennovate his home, my own work with micro-structures and design- alongside my book, and a whole lot more, but we’ll see how much makes the final short edit. Still- can’t complain- it was a blast, and we’re getting the word out there! We also spoke a little on the upcoming Summer 2011 workshop on tiny building/carpentry that Dustin and I will be hosting out of his home and seaside property in Scituate, MA….again, not sure what will make the cut though…. One part of the mindset behind tiny housing, is “Why piss away so much of the money you work TOO hard for (wasting so much of your life’s time while doing so)”? Its with this in mind, to a degree, that myself, and other friends/relatives approached gift giving this holiday season. If it wasn’t hand made, the theme from some was “useful only”- no crud/trinkets. I’m one of those people who feels they truly don’t need anything, and tell most people that, but amongst the very generous gifts I received, my faves…. A homemade “bird-nester” from my wife (A mini wire feeder, filled with yarn, ribbon, and bow scraps from past holidays). The birds grab these, and weave them into their own nests, which become quite colorful). These are so easy to make, incorporate recycling, and the end product (the nests) are really beautiful. A flexible, mountable work light from my in-laws- these definitely come in handy when the sun goes down on work sites. And a homemade button wreath from my sister-in-law (to replace our old wreath that was falling apart). If it were up to me, I’d like to do a whole season of nothing but small, simple, handmade gifts, but that’s always a tough sell…. 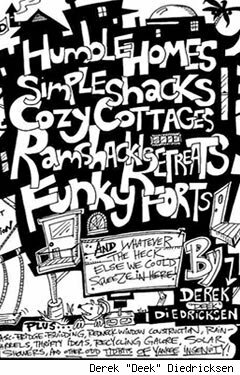 As for myself, (shown far above) one of the gifts I handmade (a cartoonified design is in my upcoming book and might be featured in the upcoming issue of Countryside Magazine) for my mother was a free pallet-wood deck chair for her deck at home. I’ve been experimenting with these lately and this one is quite comfortable and simple to build (although I need to extend its front legs). Its damn rugged too! 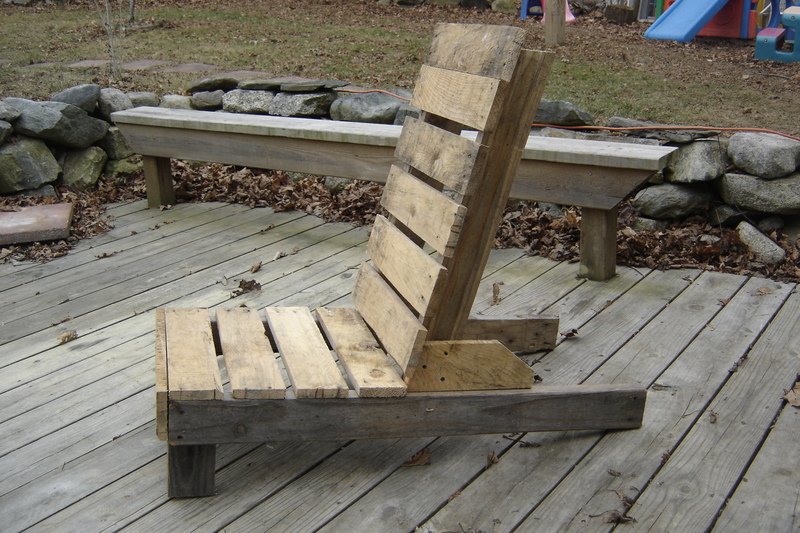 These are great for camps and outdoor use because, well, if you’re the unfortunate recipient of theft/vandalism at your home/camp in the woods, and you lose a chair or two- they truly cost NOTHING to make (using salvaged nailed/screws)….so the loss could be worse. Naturally, you could prevent their theft by surrounding these chairs with booby-trapped, pungee stick pits in the off-season. Kidding…kidding…. http://www.craftzine.com , http://www.shoestringmagazine.com and http://www.treehugger.com (amongst others) often have some good thrift-gift ideas. 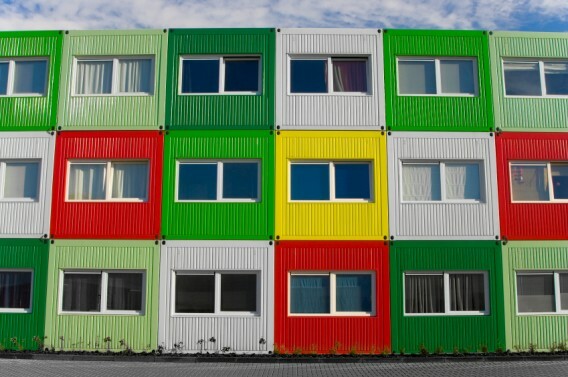 Sorry to bury my “Tiny Cabins In a MA Blizzard” post so quickly (you can scroll down to check it out)- I just saw this very cool/vivid photograph from an entry on “15 container homes” over on http://www.JetsonGreen.com (a great site), and had to share…. Jetson Green has more info/specifics on this…. This shot would make a great wall hanging/print! Also, in the ongoing updates for my hands-on tiny house/carpentry workshop this summer in Scituate, MA– I forgot to mention, in the spirit of simplicity and thrift/conservation, that we’ll also be doing a few solar oven/cooking demonstations courtesy of support in this endeavor from http://www.solarovens.net. Weather pending, we’ll be cooking some of our provided meals for the attendees on a trio of solar cookers- one of them a model I myself built from curbside materials/salvaged goods. THESE things get scorching hot- as all skeptics will see. 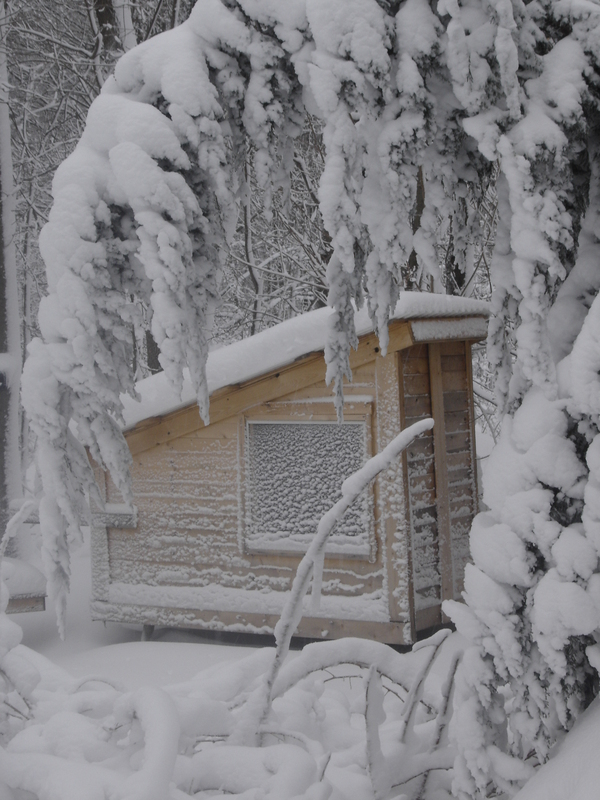 Tiny Massachusetts Cabins/Homes in a BLIZZARD…. 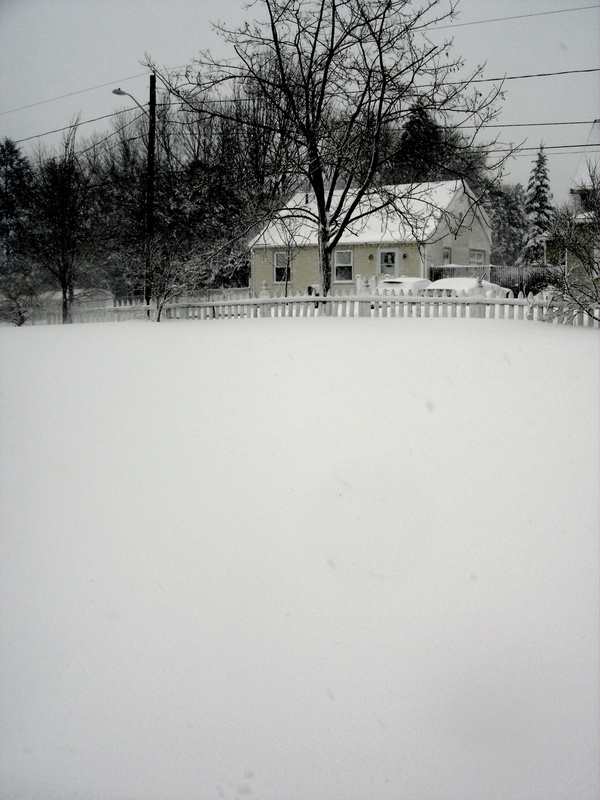 The beauty of heating your home with a woodstove, is that with power outtages everywhere (luckily not us, or I wouldn’t be posting this), you really don’t have to worry so much about snowstorms. 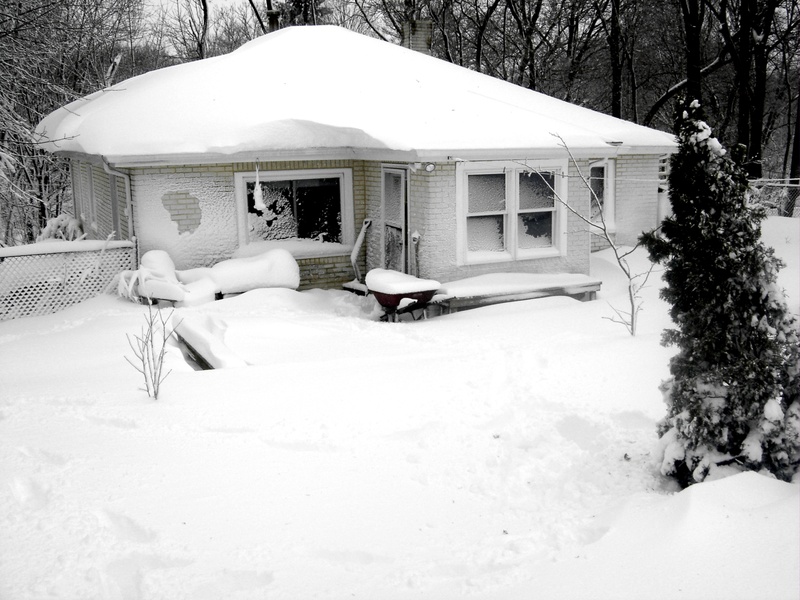 On the otherhand, you do have to worry about every neighbor wanting to stay at your home when all hell breaks loose and there’s no heat elsewhere. 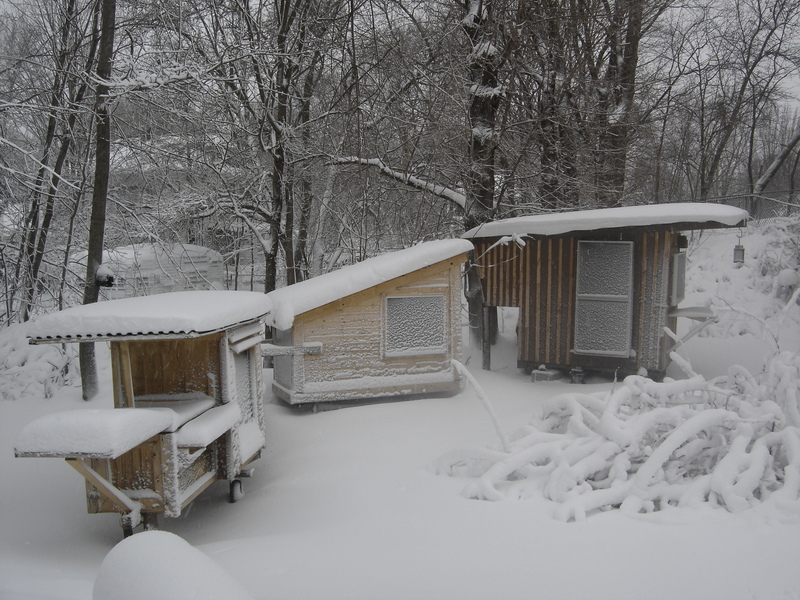 Anyway, I trudged out in the snow this morning (18″ or so, and STILL comin’ down) to take a few photos of my cabins, and the neighborhood. Dustin (my brother) is in Scituate, MA- and while they didn’t get much snow, many areas of his town saw over EIGHT FEET of flooding- we’re talking houses in mid-water in some areas. Yikes! I talked to him this morning and his tiny home is high n’ dry. 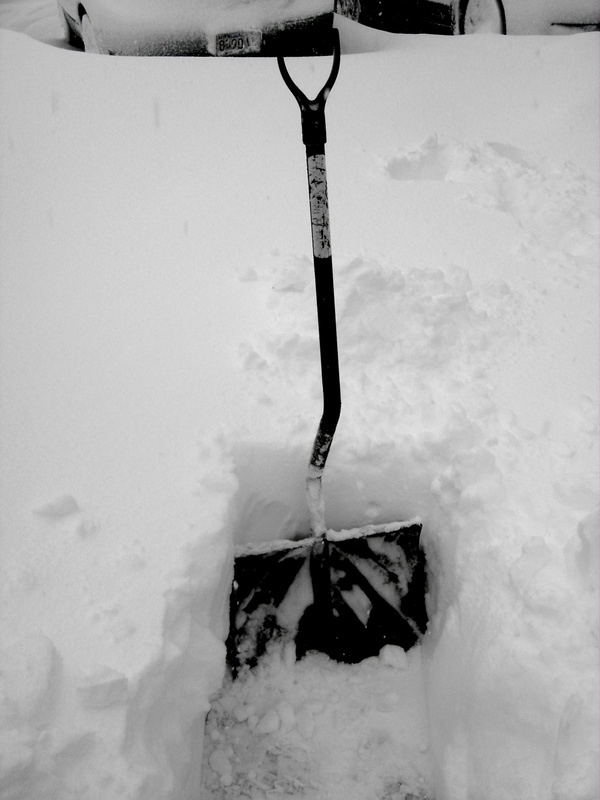 Enough bloggin'-I gotta get back to work!